Convenience stores are slowly crowding up our city, Jakarta. From the wildly popular among the youth, Seven-Eleven chain of convenience store, which now can be found almost every 100 metres (haha, a bit exaggerating, but true to a certain extent), to Circle K, and now we have a new addition on top of those: Lawson Station. The store I visited in Mangga Besar was quite small, but on the second story, they provide sitting & dining area with open air concept (no air conditioning, sorry) overlooking the bustling Mangga Besar street. What caught my attention was of course, the quick bites and fresh snacks available. 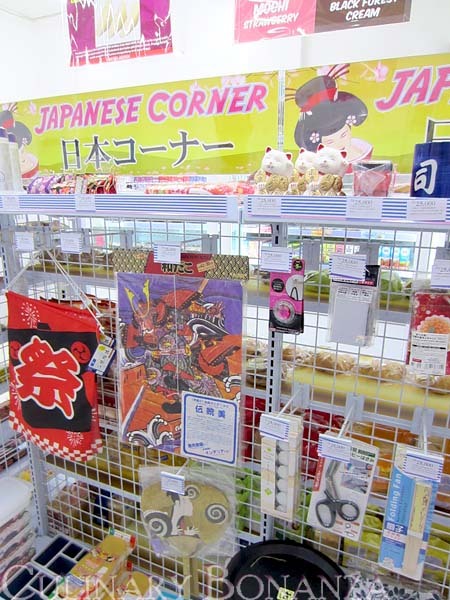 Apart from the must-haves do-it-yourself coffee machines, there's also onigiris, rice bowls and a melange of fried treats on sticks. 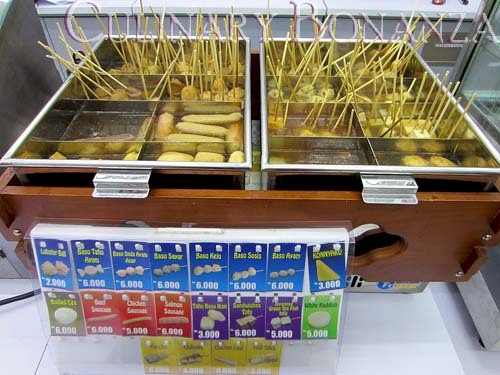 Although I personally don't have the guts to try out the fried sticks (no idea when was the last time they replenished the frying oil), but the onigiris actually looked quite appealing. Then I went to the cold section, as expected, you can find microwavable simple meals such as spaghetti, etc. And there's the dessert, like the Mochi and Cream, as well as chocolate eclairs, etc. 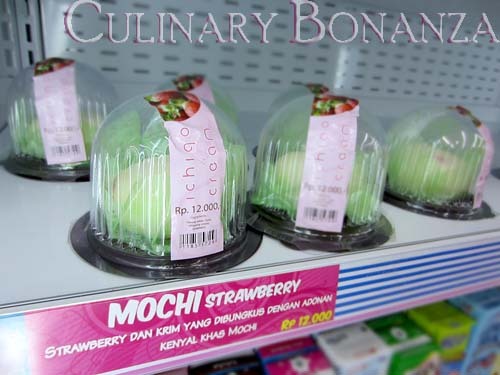 I bought the cute looking Ichigo and cream mochi (ichigo is strawberry in Japanese). I was disappointed to find that it was actually 95% cream inside and only a pathetic piece of strawberry in the center. 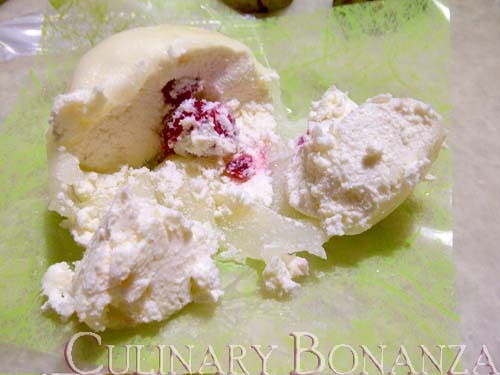 The cream was way too fattening that I only end up eating the soft snowy skin of the mochi. 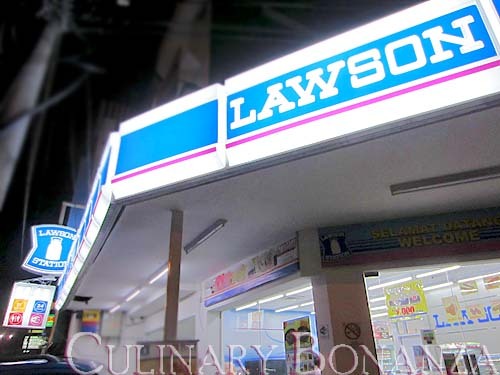 Maybe other Lawson outlets will have wider and fresher selection of goods? 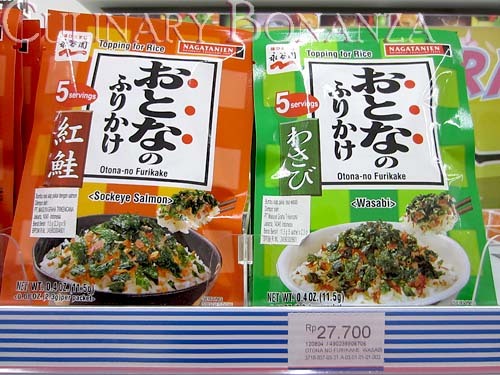 If you feel like having some Japanese flaky topping to go with your rice, then Lawson is probably the only convenience store (outside the high end supermarkets) where you can find it, and at quite affordable price. For complete list of other outlets, click here. 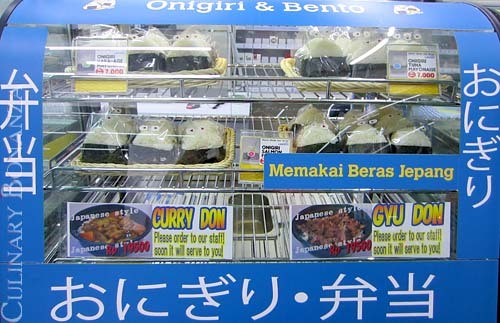 Onigirinya juga enak! cukup buat ganjel perut kalo jam nanggung. Udah beberapa kali maen ke culinary bonanza, tapi baru kali ini comment. Hi Andy! Salam kenal juga. Makasih udah sempet berkunjung ya. Gw juga udah visit blog lo, tp blom sempet comment hehe...will do soon!